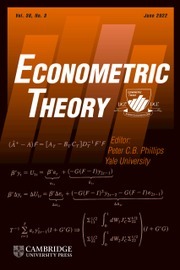 Since its inception, Econometric Theory has aimed to endow econometrics with an innovative journal dedicated to advance theoretical research in econometrics. It provides a centralized professional outlet for original theoretical contributions in all of the major areas of econometrics, and all fields of research in econometric theory fall within the scope of ET. In addition, ET fosters the multidisciplinary features of econometrics that extend beyond economics. Particularly welcome are articles that promote original econometric research in relation to mathematical finance, stochastic processes, statistics, and probability theory, as well as computationally intensive areas of economics such as modern industrial organization and dynamic macroeconomics. Contributions that exposit methodological and technical advances in these fields and that illustrate their potential in econometric research are actively encouraged. Articles that unify earlier econometric work either in productive ways or by the use of more elegant methods lie within the scope of the Journal. In recognition of the interface between theory and practice in modern econometric research, ET encourages submissions that promote best practice econometrics by demonstrating new theory in conjunction with the practical implementation of theory. As well as articles that embody original theoretical research, ET publishes historical studies on the evolution of econometric thought and interviews with the subject’s leading scholars.